A couple of weeks ago I was in Sainsbury’s when I spotted a giant snowflake cookie cutter. It was only £4 and with Christmas fast approaching I thought it would be perfect for trying out some Christmas biscuits. If you’re looking to purchase one they are available via eBay and other cake related online shops. £4 is a bargain as they can sell for as much as £16! Gingerbread has become very popular at Christmas with gingerbread houses, men and various other Christmas related shapes gracing magazines and shops. I’ll be honest and say I’m not overly keen on ginger. I knew I needed a biscuit dough that I could roll out and cut to use my cookie cutter so had been investigating different spiced Christmas biscuits. I came across this BBC Good Food recipe for chocolate gingerbread and thought that the chocolate might help distract me from the taste of the ginger! The recipe is originally intended to make an advent calendar so makes a good quantity. 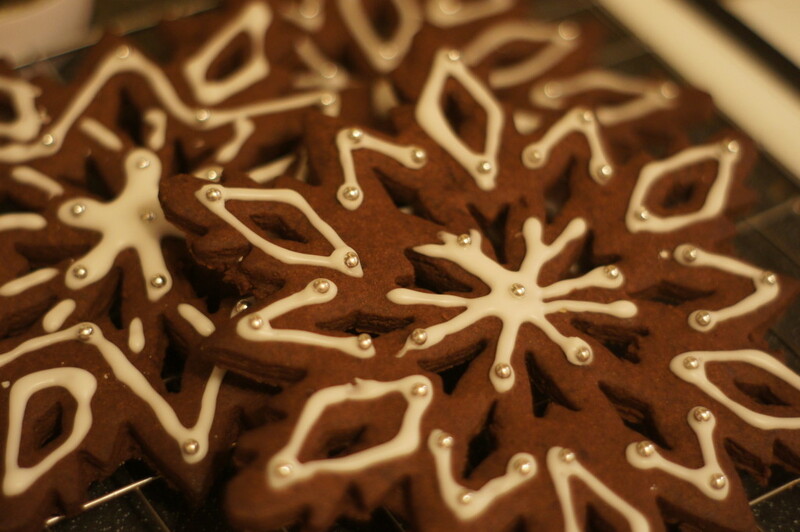 I made 3 large snowflakes and also made some reindeer (also using a Sainsbury’s cookie cutter).